i Click 'view all' to instantly compare this ok deal with offers on other top nixon watches for men. 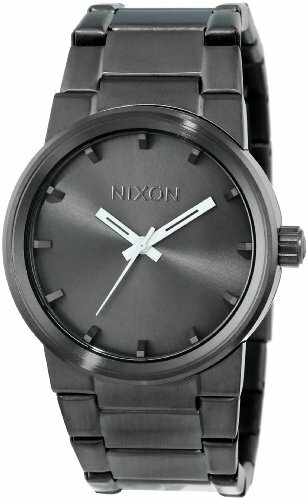 Nixon Men's Cannon Japanese Quartz Stainless Steel Watch Gunmetal is currently selling at $76.49, approximately $0.29 higher than average. With a lowest price of $75.00 and an average of $76.20 it is selling on the high end of its usual range. Price volatility is 0.74% (meaning it does not change often), so you might have to wait a while for the price to drop. Right now this product is a recommended 'ok deal'. Compare the current price, savings (in dollars & percent) and Buy Ratings for the top Nixon Watches For Men that are closely related to Nixon Men's Cannon Japanese Quartz Stainless Steel Watch Gunmetal. Here is how Nixon Men's Cannon Japanese Quartz Stainless Steel Watch Gunmetal compares with other leading Nixon Watches for Men. MAKING THE LITTLE STUFF BETTER.We make the little things better. The small stuff that can't be ignored. We pay attention to it. We argue about it. We work day and night to make the little things as good as they can be, so that when you're wearing our products, you feel like you've got a leg up on the rest of the world. MAKE A STATEMENT.The Cannon is your daily driver accessory. With clean lines, bold details, and a classic appeal, this watch oozes high-profile style while still maintaining a subtle confidence to accompany you along any social interaction. SOCIAL RESPONSIBILITY.Nixon's Supplier Code of Conduct ensures all of our suppliers are adhering to socially-responsible business practices, meaning all products are produced under lawful, humane, and ethical conditions. ACCESSORIES THAT REFLECT WHO WE ARE & THE LIFE WE LIVE.Fueled by adventures far and wide, and sometimes by those that happen unexpectedly, we deliver products that meet your needs. We travel the globe to fully experience life, and those experiences take shape in the things we create. EXPRESS YOURSELF. Style is an extension of who you are. When you wear a watch, you deserve to have something that reflects your entire package. We're here to provide that voice to the personalities and characteristics that can't be put into words. FeaturesCANNON. A high-profile design with a dash of street style, Nixon's 39.5mm all gunmetal stainless steel Cannon is clean cut and sleek with simple lines, tapered 3-link bracelet, and a direct point of view.SIMPLY STATED. Rooted in simplicity with a contemporary appeal, the Cannon is a classic statement accessory with its 3-hand movement, large attached stainless steel indices, and custom molded hands.DAILY DRIVER. The Cannon is dynamic enough for daily wear and clean enough to dress up or down. Something you would find on the Upper East Side, the Cannon is your daily driver.FUELED BY ADVENTURES. We deliver products that meet your needs in various high-intensity work and play environments, whether it's across the globe or close to home.